For under $200 PC and console gamers can get a responsive computer monitor that’s ideal for competitive gaming. Here’s a look at five amazing options. Lately, I’ve been seeing manufacturers charge a small fortune for their gaming monitors. If you’re a competitive gamer, don’t get lured into the trap. I’m not saying it wouldn’t be nice to have a 144Hz IPS G-Sync monitor, but there are other good options out there under $200. I’ve been a competitive FPS gamer for well over a decade at this point and the one thing that’s most important for these types of games is low input lag. No, not response time. That’s the time it takes for a pixel to go from black to white and back again. Anything under 5ms there and you’re good to go. Instead, I’m talking about the lag between when you enter a command in your controller, keyboard, mouse, or whatever and it shows up on your tv or monitor. In twitchy or time-sensitive games and genres this is a must. Refresh rate is the amount of times per second that a frame can be drawn or updated on your monitor. As the PS4 and Xbox One don’t go above 60 frames, the 60Hz that’s on any standard monitor is good enough. Even the PS4 Pro won’t go beyond 45 frames. For PC gamers, refresh rate matters if and when you’re able to achieve performance in excess of 60 frames a second. If your machine can’t handle that on a game, it’s not important. If it can, you’ll see some solid improvements in responsiveness and fluidity overall in high refresh rate monitors. Want to know how to connect your console to a computer monitor? It’s easy. Simply use an HDMI cable to connect the monitor to either the Xbox One or PS4. Looking for a good gaming monitor that fits your $200 budget? Here are five options based on what you might be looking for. PC gamers with AMD graphics cards will likely prefer the inexpensive and new FreeSync compatible monitors on the list below. With low input lag and refresh rates above 60, these are some of the better deals you’ll find. 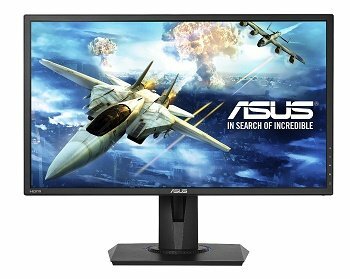 Console gamers can find a super cheap option in the Asus VX238H, a $110 monitor that’s incredibly responsive or even an inexpensive IPS option in the Asus VS239H-P. Those looking for a good 4k option for the PS4 Pro will find it in the Asus MG24UQ, the only monitor above $200 on this list. Any of these monitors can be used for either console or PC gamers but may make more sense for one vs the other. For more information on each, see the reviews below. 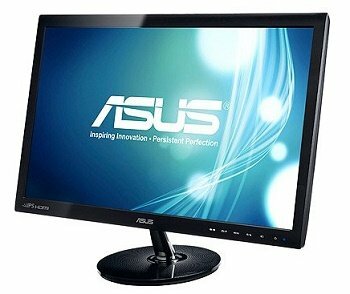 If you’re just looking for a monitor that is highly responsive and inexpensive, look no further than the Asus VX238H. For around $110, it’s a fantastic option with incredibly low input lag and plenty of connectivity options for all of your devices. In addition, it uses Asus’ eye care technology which lessens eye fatigue over those long gaming sessions. For especially good responsiveness, use the Game mode. That goes for the other monitors on this list with game mode as well. Overall, this monitor has a great picture, is inexpensive, responsive, and has plenty of features. I’d recommend it for any Xbox One or PS4 owner. In the next week, I’m building a budget PC for my brother. I wanted to wait until the GTX 1050 Ti came out to make my decision on just what graphics card for him to get. After seeing that he could get a RX 470 for just around $20 more we went for that. In addition to being a much better performer than the 1050Ti, the RX 470 supports AMD’s FreeSync Technology. This gives you a tear-free experience in games. If you’ve never experienced it, you should. The difference is night and day. Monitors like the Asus VG245H are perfect for that. At under $200 you truly get a ton of value. Clearly you get a solid panel with a sub 1 frame input lag, 75Hz refresh rate, and FreeSync but it’s more than that. The quality of the stand, for example, is fantastic and allows for full height, tilt, swivel, and pivot adjustment. Honestly, it’s one of the better I’ve stands I’ve used. Considering I’ve used monitors that cost many times this one, that’s an impressive feat by Asus. 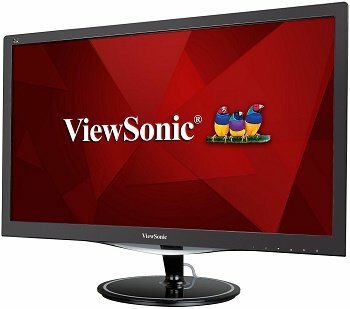 If you’re looking for a bigger monitor than the one I listed above, check out Viewsonic’s VX2757-MHD 27″ monitor. Like every monitor on this list, it has an incredible amount of responsiveness and is ideal for any type of game. As far as the panel itself it’s a better than average TN display with deeper blacks than I expected. Connectivity options are good with DisplayPort, HDMI, and VGA connectors. If there’s one downside to this monitor it’s that the stand only has tilt and the bezel is a bit thicker than I like. If you end up using it, a third-party stand or wall mount might give you additional flexibility. Overall it’s a good value for what you pay. You get a large and great looking monitor for just around $200. 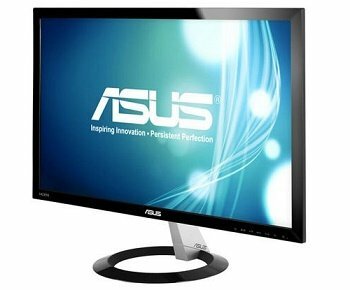 There is a 24″ version of this monitor that costs around $50 less, but I prefer the Asus FreeSync option above. Like wider viewing angles and more accurate color reproduction? 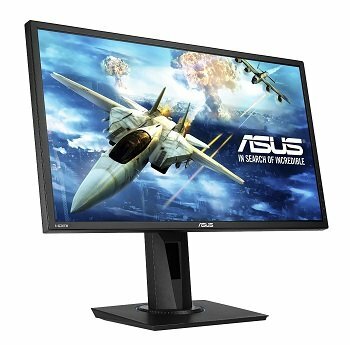 Consider the Asus VS239H-P. While I wouldn’t consider the e-IPS panel on this monitor worthy of our photo editing monitor picks, it’s still a fantastic value for the money at right around $120. The 5ms response time isn’t blurry at all and with a low input lag this is certainly one of the better budget IPS gaming monitor options that I’ve seen (even if it is a few years old). For connectivity, it has D-Sub, DVI, and HDMI available. Overall the Asus VS239H-P is still a great value for what you spend. It’s as cheap as the VX238H TN monitor above, is nearly as fluid, and has better color. Admittedly, this monitor doesn’t fit our $200 mold. Still, as many of you are considering an upgrade to the PS4 this holiday season, I thought I’d include it. If you’re willing to step up to $300, you’ll get an amazing option in the Asus MG24UQ. Specs include 4k, AMD FreeSync technology, IPS color reproduction, and an amazing adjustable stand. 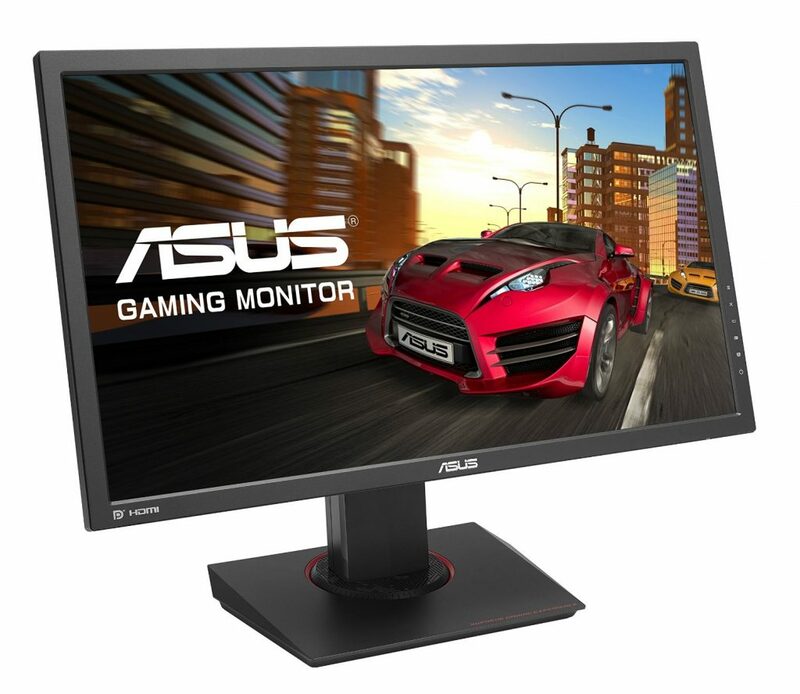 The Asus MG24UQ is an ultra-responsive gaming monitor with a low input lag, 4k, and an IPS panel all for around $300. A similar G-Sync model would certainly cost in excess of $500. The stand on this model is absolutely fantastic. Tilt, swivel, pivot, and height adjustment allow for you to move it exactly to where it’s most comfortable. I’m glad to Asus moving forward for this option and it’s something I’m hoping to see on more and more monitors moving forward. The Asus MG24UQ has a 4k UHD IPS display with a 4ms response time and negligible input lag. Color and viewing angles are fantastic and connectivity is good too with HDMI (v2.0), DisplayPort, and HDMI (v1.4) options. Like a couple of the monitors listed above, this one includes AMD’s FreeSync adaptive-sync technology. This allows it to deliver stunning and seamless visuals. While this won’t benefit console owners, it’s a fantastic extra option for PC gamers. The MG24UQ is definitely worth the money if you have a computer that can run games in 4k or plan on upgrading to the PS4 Pro. It’s not a bad deal at just around $300 and will certainly be useful for years to come. What are your thoughts on the monitors featured above? Please take time to leave us a comment and vote in our interactive poll below. Which monitor do you plan on purchasing from this list? I’m looking for a 27 inch monitor for the sole use of my Xbox One S and wondering which is a better option between ViewSonic VX2757-MHD or Asus VE278Q? Thank you for your help.